Ok guys, I have a '80s german bass in the WS with that typical Rubner-style of block where the ribs sit snug up against the heel, with no ledge and ebony strip at the sides. The mortise is about an inch deep. So, the neck has popped out and taken away some of the wood at the sides of the block, but as you know with this style, there isn't much there to begin with because the sides of the mortise taper away to nothing. First I thought I'd just build up the sides of the mortise again, but I wondered how strong this would be as this would only really be glueing "packing" between the ribs and the heel, and wouldn't be substantially joined to the block itself. But in fact the heel was only ever in glue contact at the sides of the mortise, so it has only ever been the ribs and the button holding it there all this time! Is there any trick to more reliably restoring the mortise here, short of replacing the block with something a little more substantial? Matt, can you post a few pics? It would be much easier to understand the situation with a good visual or the problem. When you say Rubner type, which generation of Rubner are you referring to. I think the work of this Family varies on the generation/maker. In the '80s, (1980's) it would be the 3rd generation Johannes as the others have since passed on. I still see this name from recent years but don't know if there is a 4th generation or it's just a brand name that has carried on somehow. This type. This is not the one I'm repairing though. All rubners i have come across have the same neck/rib arrangement with no ledge and decorative strip at the top and thus very thin mortise walls. Looking over my Basses in the rack earlier I would say many of them are like this originally without any cappings but sunk in about 3/4" to 1" into the Block on average. Some much more but closer to an Inch on average. Personally I don't like the Neck too deep in as it plays easier with less Heel moving into thumb position. If the Top is off you can do more. Blocks can be beefed up inside and the Neck sunk lower as well. Depending on how deep the Block is you can drop the Neck in a little lower if making a new Neck. If not, then you don't have room without altering the Back Button. In this case you need to re-build the Block slightly and if need be, repair the Rib meeting the Neck. From the outside things are harder to make look its best but without seeing the actual bass, I can't say much more which way to go. If the Block is good, a slight re-build and a good re-fit should be just fine. With the cappings you mention on some commercial basses, this is totally decorative. It is the bottom fit mainly with the block sides and Back supporting the fit that holds the Neck. How much platform across the sides of the Block till it meets the Rib has little to do with support. In this case, you need more Block inside the Bass to hold it all together. Arnold is away this week but I am sure he will chime in on this. On just my basses alone that he has worked on, just about every method I mentioned above was done depending on what the Bass needed. Ken, there is plenty of block inside the bass and i don't need to set the neck deeper for scale length reasons. 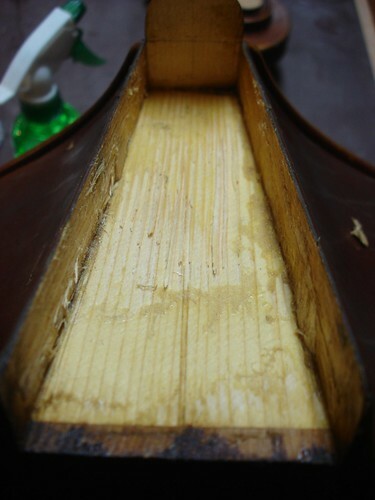 On basses where the walls of the mortise are this thin there appears to be little lateral strength, but perhaps this is unimportant, which is why i was after another luthier's view. I can easily rebuild the walls of the mortise but I was wondering how much strength this would really add, as I would have only a small glue surface to the actual block. The "decorative" strip, in my view, caps perhaps 6-8mm of thickness at either side of the mortise and this thickness provides significant strength to the block area. This is how i build my neck blocks. On this bass, the back is off, so there is scope for some extra work. I'll look forward to what Arnold and others might have to add. I always hate refitting a mortise like this as it seems as if there is not really enough gluing surface-especially if you have a lot of weight on the scroll with heavy German tuners or an extension. But if it is very well fit then it winds up being sufficient. Remember that by far the most important of the three gluing surfaces [sides, bottom, or button] is the button. Leverage! Jeff, what would be in your opinion the 'least' important surface then. the bottom or the sides? anyone ever use screws from block to heel? I have seen it. More work fixing it from the screws than it took putting them in I'm sure. Bad idea. If someone did that to one of my Basses, that person would need to hide! A good joint with strong hide glue would work just fine. Screws put in from Heel to Block is an emergency repair that ruins the integrity of the Neck. A neck graft would be needed in my opinion to un-do the damage as well as possibly needing a new Block as well. For a cheap school plywood bass it's like fixing furniture, a handy man repair, not a Luthier job regardless of who does it. If put in from the inside, either the same mentality or the person doesn't know how to fix the block or use glue. What if a screw comes loose? What if a screw breaks because that was all that was holding the neck and it suffered more damage in handling breaking the screwed repair? Do it again with more holes, more screws? Junk on junk. At that point, instead of screws you might as well try using 2-ton epoxy! Wayne, are you asking about fixing a normal made carved bass or a cheap bass shaped object? I just got in an old Mittenwald Bass c.1850 and the Block/Rib area is just like the Rubner bass Matt described. The difference is the age. This Bass has a button repair and wood plate overlay on the Back showing that it had past damage. Basses are big. They take hits and things break. No reason in my mind to stop being a Luthier and start becoming a handy man. Right? The sides would be the next in holding power. I have taken out many a neck in which there was almost no contact between the bottom of the neck and the mortise yet it was still holding under tension. The leverage factor and also that the bottom of the neck is end grain adds to this being the weakest link. Don't be such an elitist re screws. I've done it plenty of times-don't worry, not on your basses! ...and of course not on any carved bass but sometimes its the only cost effective way to get a Kay or something similar up and running. Generally you see only amateurs using metalwork but a skilled luthier can screw with quality. a skilled luthier can screw with quality. Well, I feel better already.. So you prefer a bolt-on to a neck-thru then? Doesn't using screws to hold together neck to block make a broken neck more likely in an accident involving the neck (as opposed to the neck coming clean out of the block under stress)? Maybe they never come clean out without breaking? Ken-huh? So, you are saying-what are you saying? If my bass falls I want the joint to give and not the neck to break. Cheaper to fix that way. Thanks for your note Jeff - glad I'm not the only one to hate this type of repair. This bass has also had major button reconstruction as the button was damaged when the back came off to be re-joined. I guess i'll just pack out the voids between the ribs and the heel and make sure the mortise and heel fit well. And my addition to the discussion is this: when I work on a neck joint like Matthew's, I will chalk-fit the bottom of the neck heel, then size it before gluing it in. During clamp-up, I arrange for there to be considerable pressure downward as well as pulling in on the button. I do believe the "floor" of the joint can be structurally useful. If it is not a "wonderful" bass, why not bolt it? Check out web sites for basses with detachable necks / travel basses, to see how they do it: uptonbass.com; foldingbass.com; patrickcharton.com; stringemporium.com. There seem to be a variety of solutions for re-attaching necks.